U.S. Army Sgt. Robert Bowdrie "Bowe" Bergdahl, 29 of Hailey, Idaho, arrives at the Ft. Bragg military courthouse with his attorney Lt. Col. Franklin Rosenblatt for a pretrial hearing on Jan. 12, 2016 in Ft. Bragg, North Carolina. 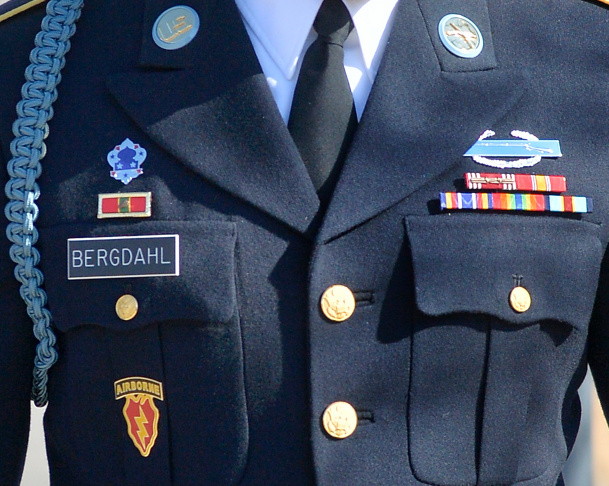 Bergdahl is not allowed to wear four particular merit decorations, including his Purple Heart ribbon during the hearings and trial. Bergdahl faces charges of desertion and endangering troops stemming from his decision to leave his outpost in 2009, which landed him five years in Taliban captivity. U.S. Army Sgt. 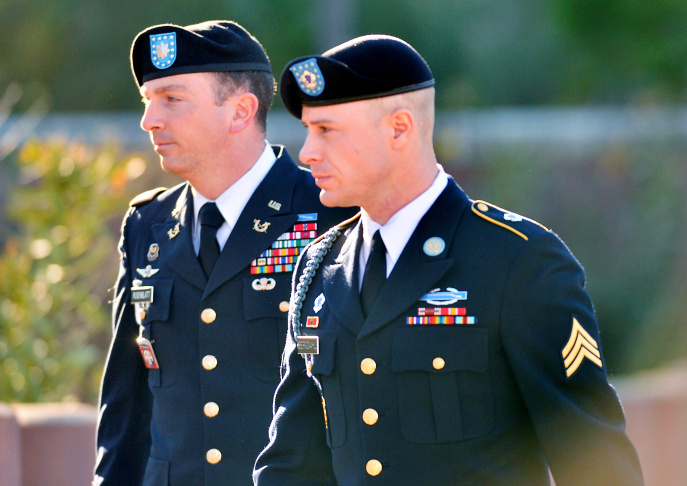 Robert Bowdrie "Bowe" Bergdahl, 29 of Hailey, Idaho, (R) arrives at the Ft. Bragg military courthouse with his attorney Lt. Col. Franklin Rosenblatt, left, for a pretrial hearing on January 12, 2016 in Ft. Bragg, North Carolina Bergdahl faces charges of desertion and endangering troops stemming from his decision to leave his outpost in 2009, which landed him five years in Taliban captivity. 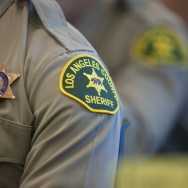 Lawyers clashed Tuesday morning at a preliminary hearing for Sgt. Bowe Bergdahl at Fort Bragg, N.C. He sneaked off his post in Afghanistan in 2009 and was held for five years by the Taliban. The main issue of the hearing is how much access Bergdahl’s lawyers will have to classified information. Also, one of his attorneys told the judge that he deserved four decorations he hadn’t received, including the Purple Heart and Prisoner of War Medal. Not being able to wear them suggests guilt, the attorney said. The judge will rule later on the access to classified information. 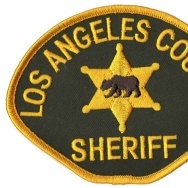 The judge also said there’s time to work out the decoration issue before the court martial, which is scheduled for August. Bergdahl faces charges of desertion and misbehavior before the enemy. He could be sentenced to life in prison. This story is a part of the American Homefront Project — a joint effort of KPCC, KUOW and WUNC — reporting on American military life and veterans.